Our weekend in Jersey was well underway, and after a full day of exploring St Helier, we returned to the hotel in order to take advantage of The Club Hotel’s spa facilities. As a guest of the hotel, you are able to use the indoor salt water pool as well as the salt cabin, the experience shower, and the sauna. We really enjoyed the relaxation and the quiet of the spa, particularly the pool and the salt cabin. We didn’t book any treatments, but I had a look at the spa menu and it looked wonderful. That evening, we had extra special plans to have a meal at Bohemia, which is the Michelin-starred restaurant in the hotel. 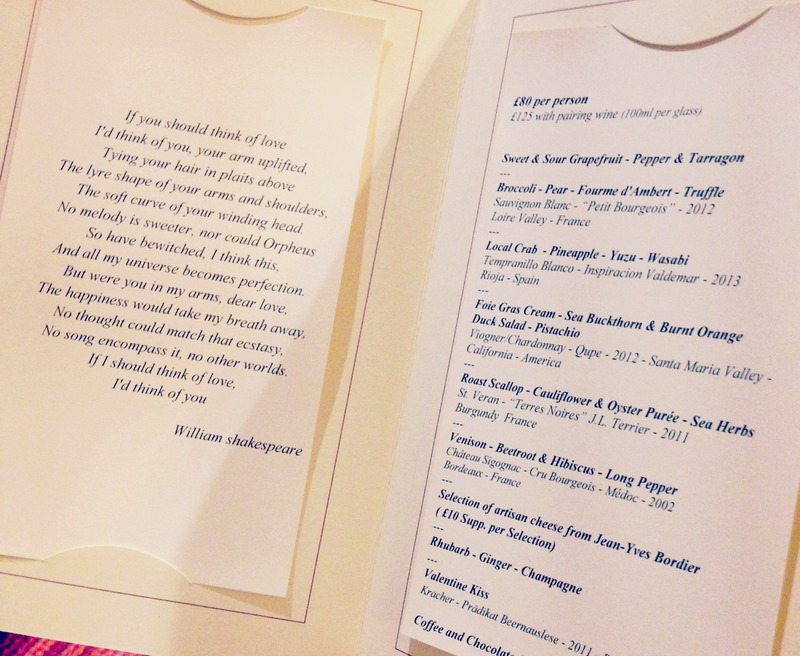 For Valentine’s Day, they were offering an eight-course menu and we were both really looking forward to it. We arrived at the restaurant and had a seat at one of the tables in the bar. Richard ordered us drinks – a gin and tonic for him and the special Valentine’s champagne cocktail for me. We let them know we were eating in the restaurant and were brought the delicious canapés shown below. 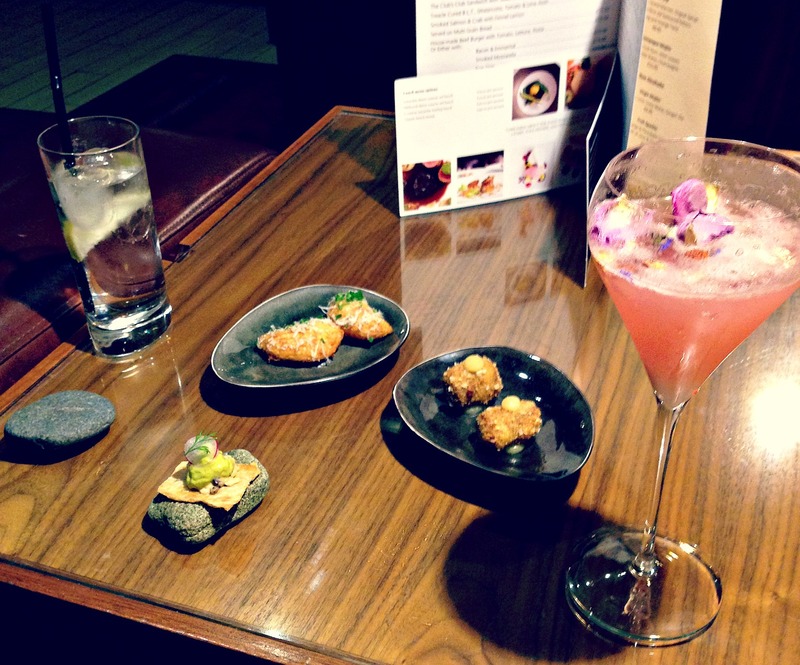 We savored these in the bar whilst we browsed the menu for the evening and soon it was time to be seated at our table in the restaurant. Someone (ahem, Richard) couldn’t wait until I took the photo before he had his first taste! As I mentioned in my previous post, we definitely went all out during the entire weekend and decided to do the wine pairing with the meal. We were so glad we did this. Each time a course had a wine paired with it, the sommelier came to the table to explain why he chose that wine to accompany the course. I’ve been fascinated with how wine can (or can’t) complement food since I lived in the heart of the wine-producing region in eastern Washington state, so it was fun to have a little lesson during the meal. Being that we both really like Tempranillo, we were excited to try the Tempranillo Blanco. It was definitely our favorite, and it was neat to try something which is the first of its kind. So, that was the wine, but how was the food? I’m not sure how to accurately describe this meal, aside from saying that it truly was out of this world. I’ve never had a meal where I have sat between bites and thought about the flavors and how the ingredients went with one another. Over the course of the meal, we spent time discussing what we were tasting. It was honestly incredible with everything cooked to absolute perfection, especially the scallop and the venison. Quite possibly the biggest surprise of the evening was the dessert described on the menu as a Valentine’s Kiss. If I remember correctly, it was passionfruit, blood orange, and chocolate served in the shape of very realistic albeit large lips! I loved hearing the chuckles and seeing the smiles on everyone’s faces as their desserts were presented. It added an aspect of humor to the meal and I loved that, plus it was absolutely delicious. A lot of my fondest memories involve eating at great restaurants with some of my favorite people. This meal at Bohemia has been added to those memories of mine and is most definitely one I will never forget. Yes, the food and the wine were the highlights, but the service was impeccable as well. Because of all of that, I can say that it is the best meal I have ever had. Honestly. Bohemia is a must-visit if you are in Jersey and want to experience world-class dining at its finest.